The Eatery, a Japanese restaurant located on the West side of Kitsilano, is known for its funky, creative dishes and is quite popular with UBC students. Since I always enjoy food that demonstrates creativity, I decided to go all the way out to Kitsilano to give The Eatery a try. 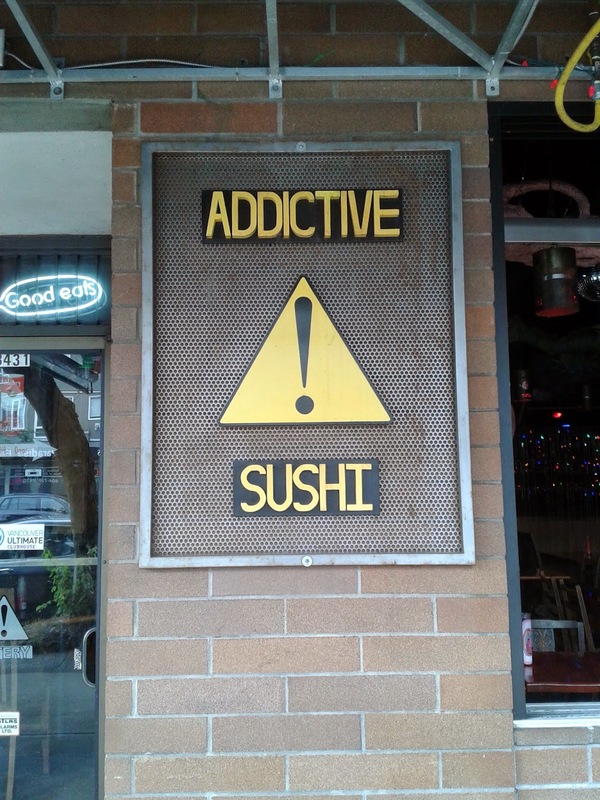 I arrived a few minutes before opening time today, and saw a sign outside warning people that their sushi is addictive. Being quite the sushiholic myself, I had no trouble relating to that. A few minutes later, I walked inside to find quiet music playing in the background, as well as lots and lots of various papier mâché and plastic decorations covering the ceiling. I found a life-sized Astro Boy figure as well as some glow-in-the-dark items among these. 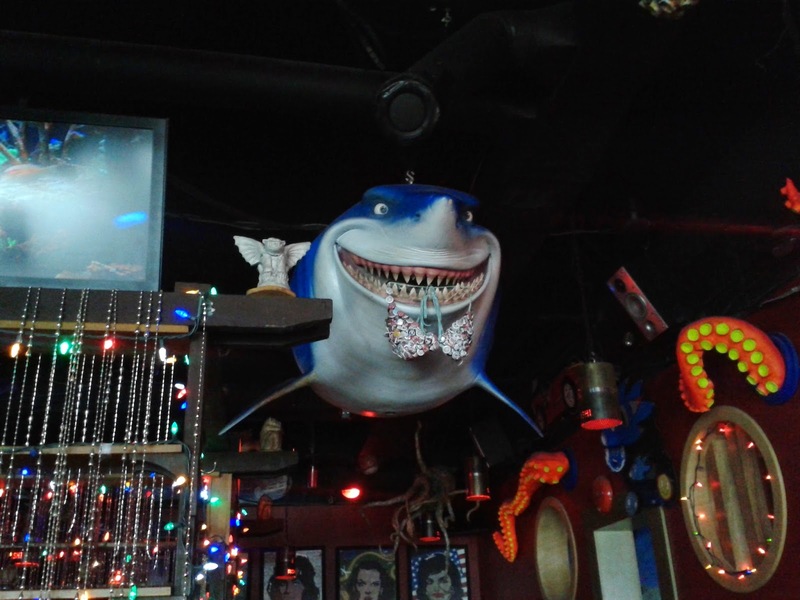 Oh look, there's Bruce from Finding Nemo! The inside of the restaurant seemed a bit like an adults-only arcade to me. The atmosphere was very casual and the waitresses had no uniforms, wearing your regular street clothes. The furniture was slightly worn out, giving the restaurant a retro feel. I felt like the servers either had a bad day today, or were simply not ready to serve customers at 4:30. It took me a while to flag a server to take my order, and when one finally noticed, she told her colleague, "Someone's ready to order." Her colleague slowly got up from her chair and took my order. Then, my first two orders arrived after a short wait, which were hurriedly placed on my table without a word. 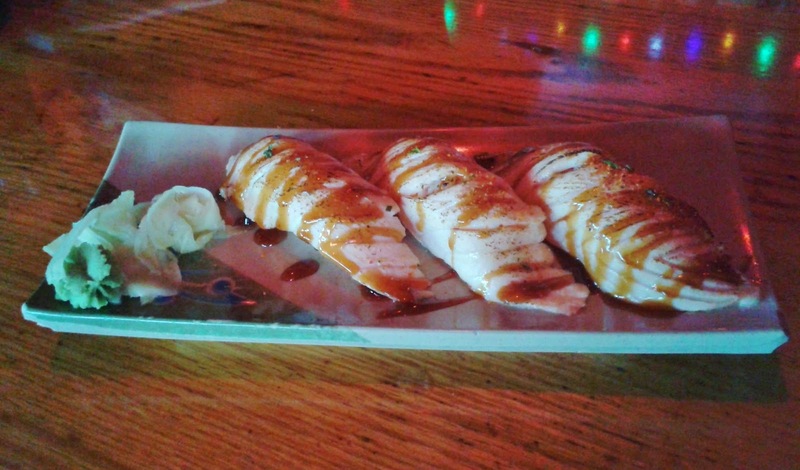 The Flamed Sushi came with 3 pieces of blow torched salmon belly, accompanied with unagi sauce and some sprinkles of peppers. 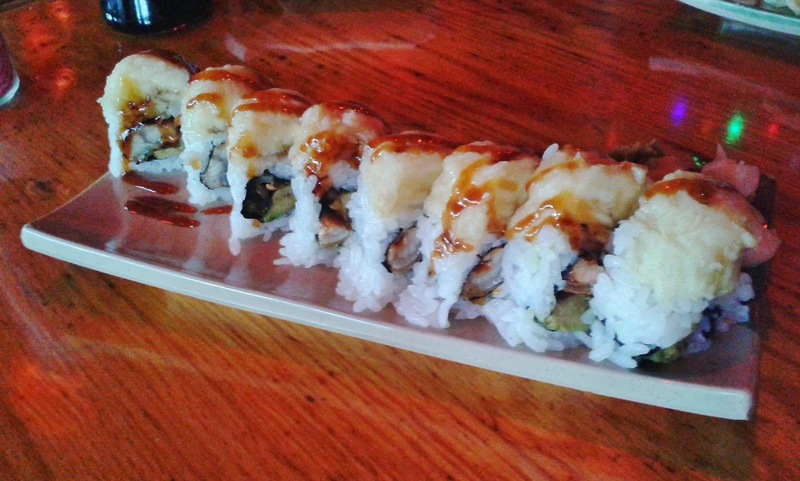 The sushi ended up being spicier and sweeter than your average seared sushi. The salmon was completely seared, mostly successfully, and had no raw (marbled) parts. The rice was warm (normal for seared sushi), but a little lacking in taste. The Electric Banana Roll consisted of eel and avocado on the inside and tempura banana on the outside. 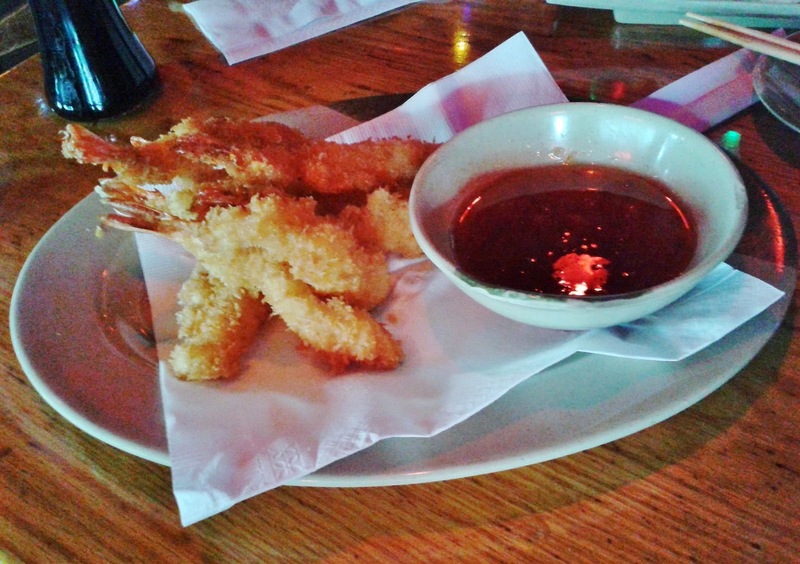 The tempura banana was amazingly soft and was quite sweet, which kind of matched the mildly sweet interior. I say "kind of" because personally, I felt that the sweetness of the banana took all the attention from the unagi and avocado inside, but perhaps to good cause. The unagi was slightly lacking in sauce and had a fatty texture. The avocado looked just a hair overripe under the dim light, but in terms of taste, this was barely noticeable. At this point, the sound controller suddenly turned the music louder, so now, it felt even more like an arcade. 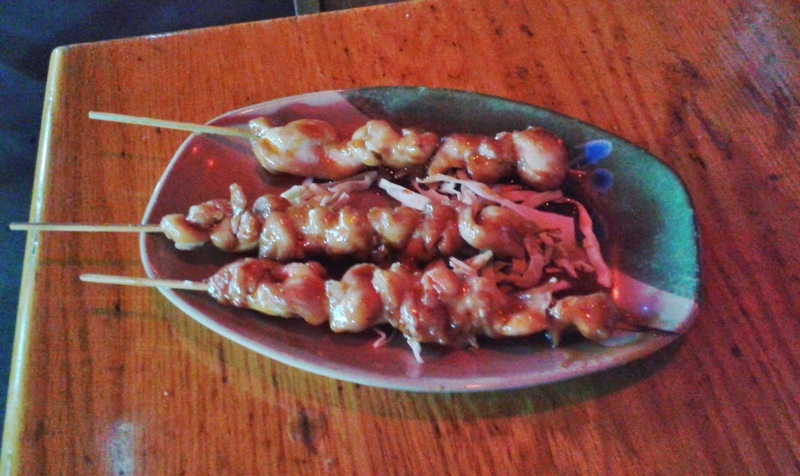 The Yaki Tori came with 3 chicken skewers with honey soya sauce. At $5.25 for three full-sized skewers, this dish is quite the value dish. The skewers themselves consisted only of chicken, but there was a thin bed of lettuce underneath. The outside layer of the chicken exhibited some toughness, but the inside was tender. There was a good amount of sauce accompanying the skewers, though I would have preferred a milder sauce. The lettuce underneath was cut very thin, but remained crunchy enough for me to easily pick them up using the skewers. My meal seemed to be gradually getting worse. On the menu, the Nobashi Prawns were described as lightly battered tiger prawns, served with Thai chili sauce. It was more like "heavily and unevenly battered tiger prawns". There were parts where the shrimp was exposed and parts where the batter was so thick that I could no longer taste the shrimp inside. This was disappointing as the prawns inside were actually quite good, and the Thai chili sauce matched well with the prawns, giving them a sweet and not overwhelmingly spicy taste. I wanted my meal to end on a high note, so I tried to order something simple, hoping that it would be executed right. 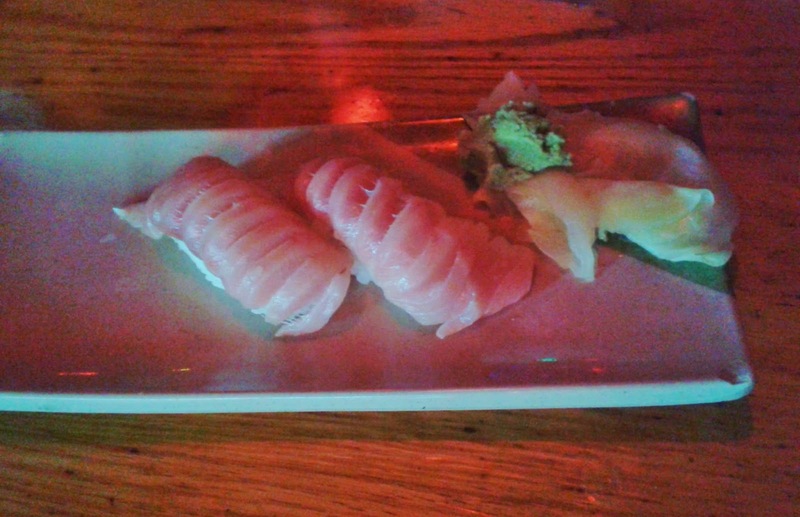 The Toro Nigiri came with two decent-sized pieces of soft tuna belly. The tuna tasted quite fishy with a metallic zing and a rubbery twang mixed in. Unfortunately, that was the least of the nigiri's problems. You know those clumps of dried rice clinging to the rice cooker after you have scooped all of the rice out? I found one of those in my nigiri! It was so unchewable that I had to spit it out, and the server didn't even stop to wonder why there was a clump of rice left on the dish when I handed it back to her. I had good service in the middle of my meal, but the service started out and ended poorly. I tried to give the server a large bill so that I could get some coins to ride the West Coast Express later. The server responded by showing me the two $5 bills she had and told me that was all the change she could give. I highly doubt that the restaurant had no coins whatsoever, so it came off to me like she wanted a very large tip off of me, which would have been fine with me if the service had been decent from beginning to end. However, it wasn't, and in the end, I gave her tips that reflected the quality of service I received. I hope that The Eatery was just having a bad day, but with my experience today, I have little reason to return and try the rest of their creative dishes. Lol "You know those clumps of dried rice clinging to the rice cooker after you have scooped all of the rice out?" Fortunately I have never experienced that at any Japanese restaurant! This was my first time experiencing that. I looked through some of their reviews on Yelp and found that someone else had the same problem!